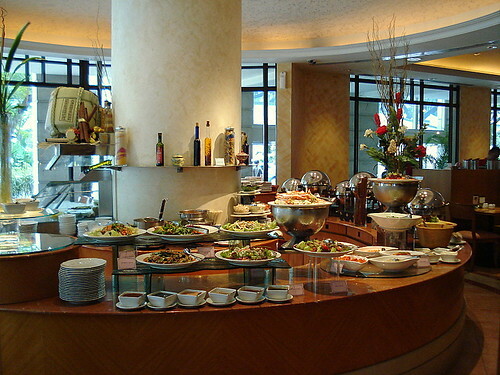 Straits Cafe main buffet area, originally uploaded by Camemberu. Mother-in-law chose Straits Cafe for her 80th birthday celebration, which included 18 guests in total. The cafe had a specially expanded spread (international and local offerings) for Father's Day as well, so the price was up from S$29+++ to S$36+++. Actually the selection was not too bad - they had quite a lot of stuff that seemed to satisfy everyone. 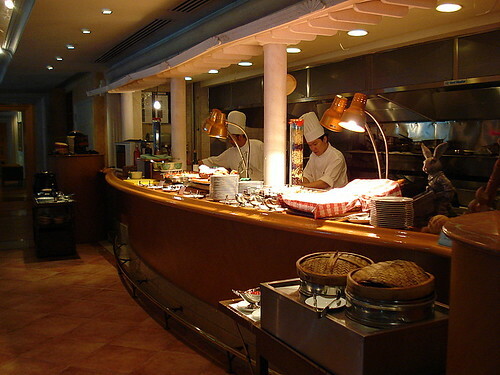 Straits Cafe carvery and grilled meats section, originally uploaded by Camemberu. I started off at the carvery near the entrance of the cafe. They had roast beef with hash browns, Peking duck, grilled chicken & vegetables, croissants, foccacia bread, two types of dim sum and a sharksfin soup trolley. 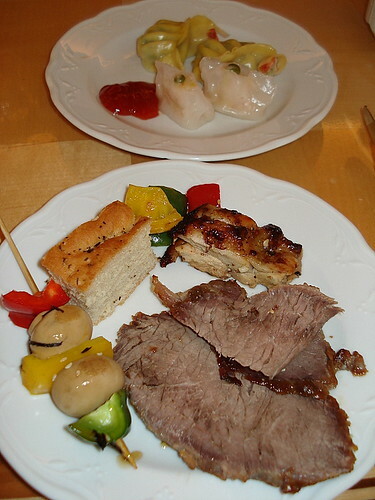 Roast beef, grilled chicken, mushroom kebabs and dim sum, originally uploaded by Camemberu. My first plate. Hubby really liked the beef, I found it so-so, a little too tough and dry, and the glaze too sweet (well, I did get served the dried out corner bit instead of the middle part which should be more moist). The rest are average fare for the most. Dim sum a bit cold. Nice foccacia bread though. 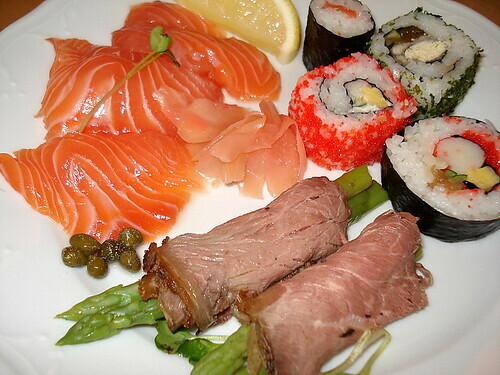 Sashimi, maki and beef salad, originally uploaded by Camemberu. The cold section had sashimi (only salmon), various maki, capers and pickles. They also had cold soba, unagi somen and hiyayako tofu which you can top with shredded seaweed and bonito flakes. OK, the sashimi was the letdown, lacking in sweetness and freshness. A good variety of salads (squid, mushroom, mixed greens, potato, beef with asparagus, etc), including a "toss your own" Caesar salad section. Potato salad extra yummy with sour cream and onions in it. 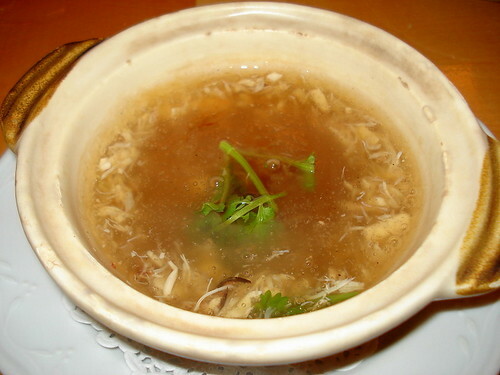 Claypot sharksfin soup with brandy, originally uploaded by Camemberu. A chef prepares this claypot for you. First a capful of brandy goes into a sizzling hot claypot, followed by two scoops of ready-made soup and a spoonful of sharksfin. There's some flambe action for a while as he stirs it. Finally parsley and black vinegar is added. Tastewise, all right but not spectacular. It's a small or mini claypot but still quite a generous bowl of soup (with crabmeat, bits of egg and slivers of tofu) even if the sharksfin is very finely shredded and not too detectable. 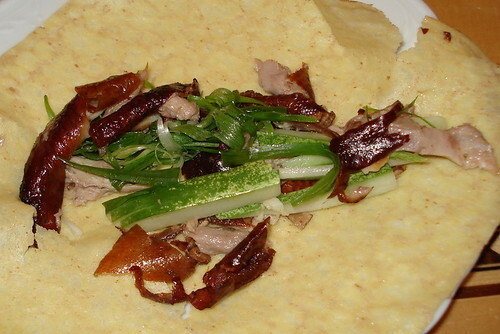 Peking duck, originally uploaded by Camemberu. Most people missed this since the ingredients were placed in small bowls looking like condiments and the crepes hidden under moist towels. The roast duck was not bad. The crepe was a bit too dry though. 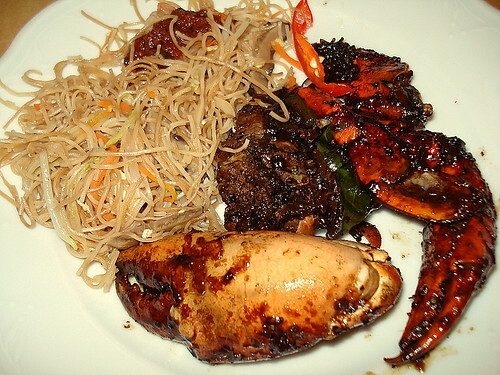 Pepper crab and fried bee hoon, originally uploaded by Camemberu. This was very popular with the guests - black pepper crab. Nice thick black pepper paste. However, just the tiny issue of crab being not the freshest or fleshiest, and the meat hard to extract. Took a long time to eat. Quite tasty though, good seasoning. 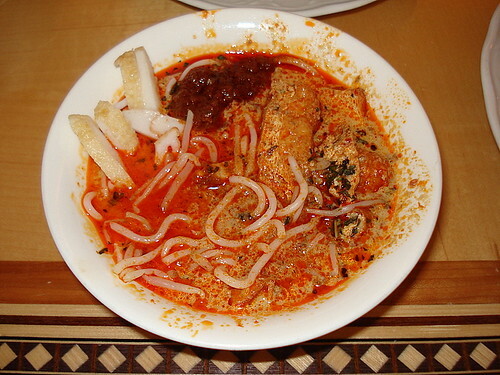 DIY laksa, originally uploaded by Camemberu. Another hit with the crowd. Laksa with good gravy and sambal. You assemble the ingredients (fishcake, beansprouts, fried beancurd, laksa leaf and noodles) to your own preference. Sorry for the messy picture - this was half-eaten before I realised I forgot to take a shot of it. And no, it isn't as spicy as it looks. Fruit and marshmellow dipped in chocolate fountain, originally uploaded by Camemberu. Desserts were probably the best section of the buffet. They really had a lot you could choose from. 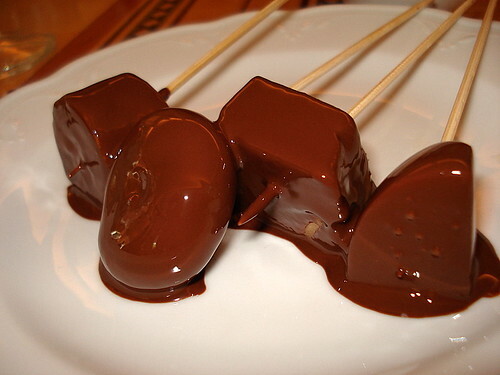 The fruits and marshmellows dipped in the chocolate fountain taste as good as they look. I'm glad the chocolate is not too sweet. This way the natural sweetness and fragrance of the fruit came forth and complemented the chocolate beautifully. 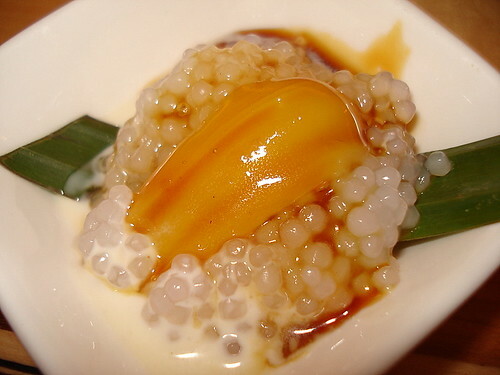 Sago pudding, originally uploaded by Camemberu. This funny concoction is sago pudding. You pour a bit of gula melaka and coconut milk over it. I think it's jackfruit on top. They also had semolina pudding, which is more like bread pudding, also with various toppings and syrups. Desserts row, originally uploaded by Camemberu. Really the most comprehensive subsection of the buffet. Durian fudge, passionfruit pavlova, caramel creme pudding, coffee mousse, assorted French pastries, Nonya kuehs, rhubarb and raisin pie, tiny desserts in shot glasses, chiffon cake, tau suan, cheng tng and red bean soup...just to name some. I can't remember all and certainly didn't get to try everything. Oh ice cream in two flavours, too, we missed. Nice lime juice next to the chocolate fountain. 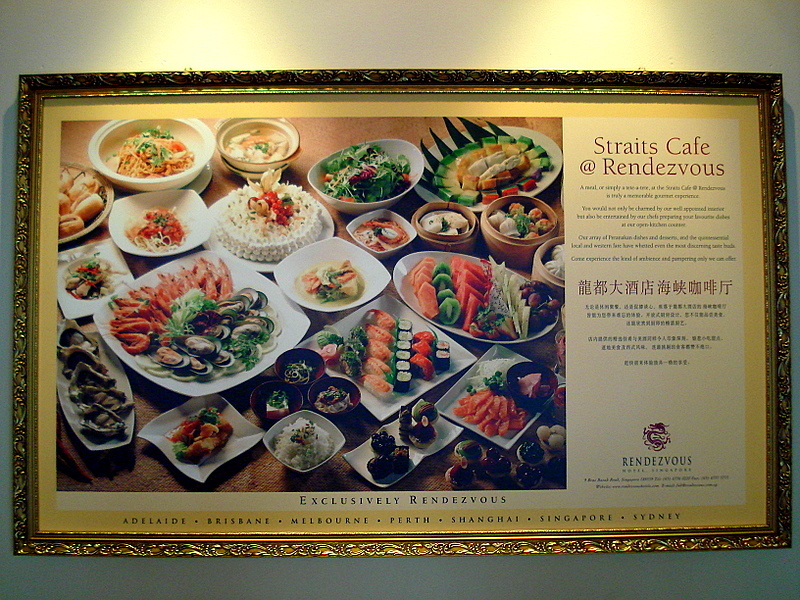 In general, Straits Cafe offers a fairly wide spread - to be honest, I didn't cover a lot of dishes, especially the cold and hot mains. Hubby said he wouldn't mind coming back again. This place was better than he expected. 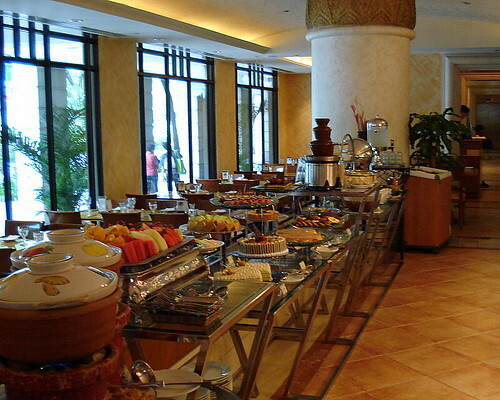 However, I'm not sure which items are included in the regular S$29+++ buffet, and which were extra just for today. Yes, there are some highlights here but personally I'd rather fork out just a little bit more and go elsewhere for better grub. I saw your blog has been decorated with a large variety of widgets! I checked abd added the "Recent comment widget" in my blog. I was looking for the widget likt that for a month! thank you! I'll stay tuned to your post as far! Hisashiburi ne! Glad to have you visiting again! Hi, I am wondering how well you grade this cafe.